First Sale to a Store!!! Today I made my first wholesale transaction with a store. The place I buy my glasses, Olympic Peaks Optical with outlets in Bremerton and Port Orchard, bought a dozen of my eyeglass leashes!! Wooo-hooo! Blue, green, pink, red and multi-colored. So if you are a customer there you will now see my items on their counter. If you shop at an independent optical shop let me know their name and I can contact them about selling my items. I will be making a list of the ones in the area that I can find in the phonebook/online and giving them a call. How exciting! Mike and I set up my booth at the Fremont Market on Valentines Day. We had a blast! I joined the market as a member so we got to set up when we got there - that gave us almost 2 hours - so relaxing. (Last time we only had about 45 minutes so we were pretty frazzled.) We broke even for the day (booth fee, membership, ferry ride and lunch), so we called it a success. I am going to be there again this Sunday. I will be sharing my booth with Kristen the potter. Come and visit us, and be sure to get a piece of the wood fired pizza - yummy! Mike is getting good at setting up the booth. We got a spot right near the front and next to the entrance to the inside part - primo!! My new arrangement - I really liked it and folks spent time browsing. Lot's of shoppers, and I was told this was a slow day! Various musicians played next to us during the day. This Sunday Feb 14th I am going to be at the Fremont Sunday Market - stop by if you are in the area. It is a fun and funky place, not to mention the center of the universe! My Etsy shop will be closed that day. 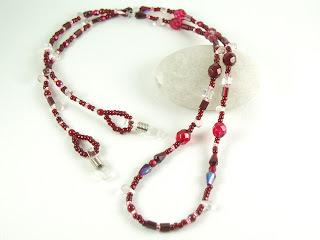 A few more red dazzlers for your ears! 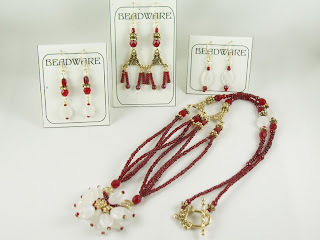 Red earrings for your Valentine.$8 and $10. 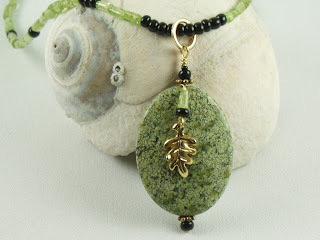 My Etsy online boutique is clsoed this weekend while I am at the iheart-handmade art show. 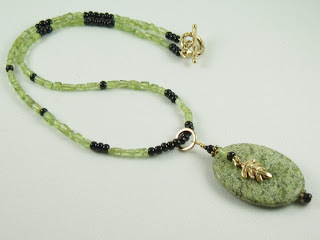 Check out the link to learn more about the other artisans participating. And if you are over by Bellevue be sure to stop in! I love these bracelets! They way they feel on your wrist, the sound they make, the way they move - they are so much fun! Pictures do not do them justice as they are very 3 dimensional. 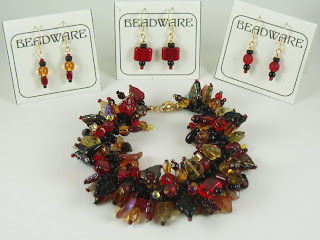 The first one mixes matte black, red and gold glass beads. The other was an after thought - but I like it the best! 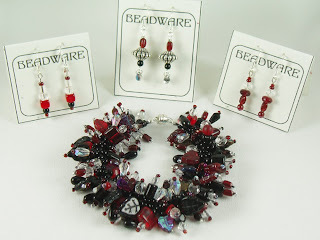 It uses black, reds and clear crystals. I am thinking up some other colors for spring time. These take a lot of patience to make as I use about 180 inches of thread for each row of fringe (there are 2 rows). First I coat the thread with wax to help keep it from tangling. Then I double it and start sewing. Slow and steady is the secret. I use miniature clothespins to keep loose ends out of the way. I sort all of the beads ahead of time and have them laid out in front of me. I will have to remember to take some pictures of things while I am working on them - next time! 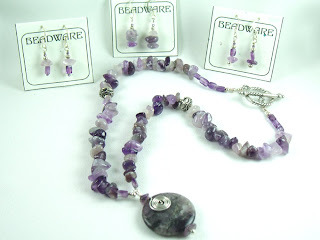 Amethyst is the birthstone for February and for the zodiac signs Aquarius (Jan. 20 - Feb. 18) and Pisces (Feb. 19 - Mar. 20). 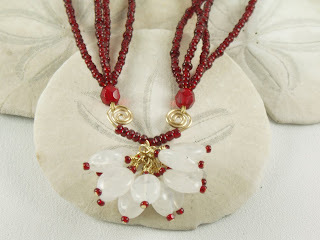 It is also the anniversary gemstone for the 4th and 6th year of marriage. Care: Amethyst often becomes paler if kept out in the sun. Clean your Amethyst with warm, soapy water and a soft bristle brush. Keep away from strong chemicals and avoid sudden temperature changes. 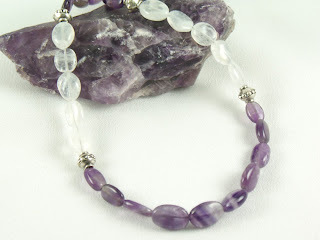 Healing ability: Amethyst magnifies psychic abilities and right-brain activity. It strengthens immunity, while energizing and purifying the blood. Ametyst relieves headaches, improves blood sugar imbalance. 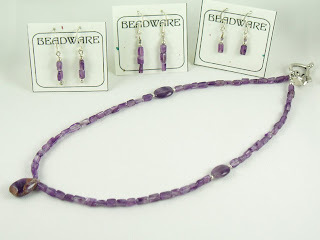 Amethyst was thought to encourage celibacy. Because of that, amethyst was very important in the ornamentation of churches in the Middle Ages. Bishops still often wear amethyst rings. 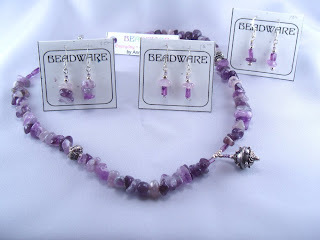 In Tibet, amethyst is considered to be sacred to Buddha and rosaries are often fashioned from it. 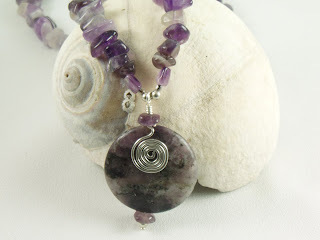 Amethyst is regarded as a love charm and as a protection against thieves. Placed under the pillow at night, the beautiful amethyst is believed to produce a calm and peaceful sleep.Amethyst is given as a symbol of sincerity, security, and peace of mind. 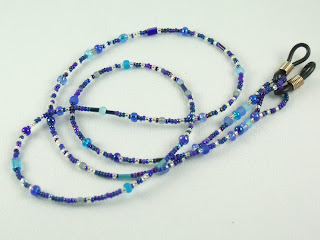 When I started this necklace I only had a vague notion of what I wanted it to look like. I struggled with several different designs and finally set it aside for a day or two until something clicked with me. 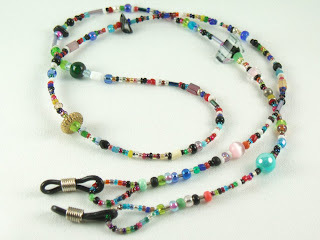 For some reason this necklace reminds me of India. Perhaps it is the red and gold combination. In India moonstones are regarded as a sacred stone. The hand-made heart-shaped pendant makes it a perfect gift for someone special on Valentines Day.